Definition at line 206 of file arc.h. Definition at line 210 of file arc.h. Referenced by AddReactOSArcDiskInfo(), IoGetBootDiskInformation(), IopCreateArcNamesCd(), IopCreateArcNamesDisk(), WinLdrInitializePhase1(), and WinLdrpDumpArcDisks(). Definition at line 211 of file arc.h. Referenced by AddReactOSArcDiskInfo(), IopCreateArcNamesCd(), IopCreateArcNamesDisk(), and WinLdrpDumpArcDisks(). Definition at line 216 of file arc.h. Definition at line 214 of file arc.h. Definition at line 208 of file arc.h. Referenced by WinLdrInitializePhase1(), and WinLdrpDumpArcDisks(). Definition at line 215 of file arc.h. Definition at line 209 of file arc.h. Referenced by AddReactOSArcDiskInfo(), IopCreateArcNamesDisk(), and WinLdrpDumpArcDisks(). Definition at line 212 of file arc.h. 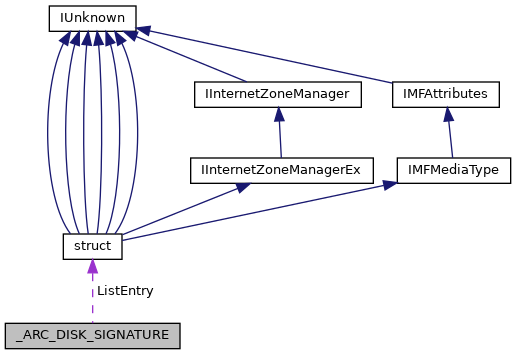 Referenced by AddReactOSArcDiskInfo(), and IopCreateArcNamesDisk(). Definition at line 213 of file arc.h.